From a forthcoming treatise on the Auburn Creed by Ben Bartley, excerpted here on the occasion of the 69th anniversary of D-Day. George Petrie wrote The Auburn Creed on November 12, 1943. He was 77. 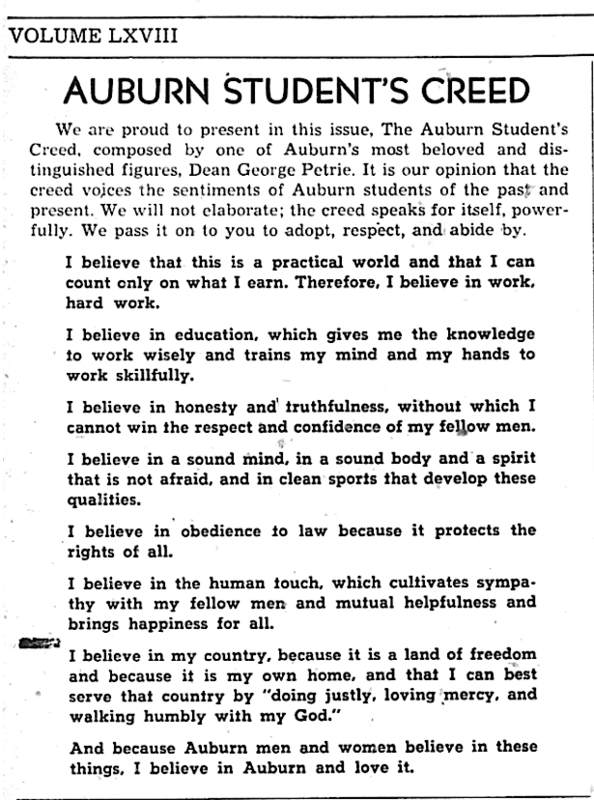 The Plainsman published the “Auburn Student’s Creed” on January 21, 1944. Shug Jordan arrived at Normandy on June 6, 1944 with a copy in his boot or his pocket or hidden elsewhere on his person. An Auburn friend sent him the clipping in the spring of ’44. Look away from your computer or your phone and think about that for a beat, that confluence. Petrie wrote it and then The Plainsman published it and then Shug carried it into occupied France. Petrie taught Jordan history. The two would sit on Petrie’s large porch, which faced Samford, the land now part of RBD’s lawn, and talk football — Petrie being Auburn’s first coach and Jordan later to become its greatest. Before the war of course, when Shug was coaching basketball and assisting football. Before he served in North Africa, in Sicily, at Okinawa. And Normandy. He was 33 at Normandy. He commanded a landing craft. He landed this craft at Utah Beach. That’s where the Nazis tried to kill Shug. They failed, but maybe only just. Shrapnel from an 88 mortar shell punctured his left arm. He bled and bled, the arm useless. He fought onward. He demolished walls, ensured victory. 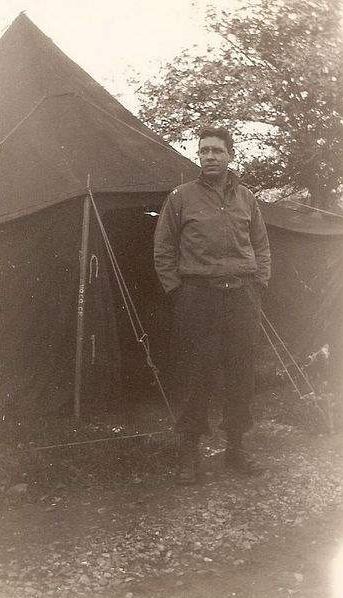 Shug during WWII, believing in America and loving it. There’s a copy of the creed in there somewhere. Photo: Montgomery Advertiser. Then followed four days of Shug prone or propped seated with his soldiers, his countrymen wounded, recovering, not recovering to his left and right, across the aisle, in this hospital where watched were the pretty nurses in white swiveling past, each like an archetypal vision of death, the stark white outline flashfried into the brain the second before extinction. Bodies and explosions and the horrible recursive ability of traumatic experience to play and rewind and play and rewind in a seemingly infinite continuance of remembrance until where the unbearable aspect is the knowledge of its forever return. To actively not think of it is already to be thinking of it. He later said he thought of football. Football helped Shug through D-Day. How is this — this war, this world, life itself — practical? With supreme indebtedness to Mike Jernigan, founding editor of the Auburn Alumni Magazine and author of Auburn Man: The Life & Times of George Petrie. Related: Rare video of Shug discussing how football got him through D-Day.